Teaching science is different to most other subjects. Students come into our lessons with a belief system based on their intuition or misconceptions developed from informal learning. If we simply attack their belief system with rationality, it will be as effective as telling deeply religious person they are wrong! We have to think differently. One approach is Three Act Science. 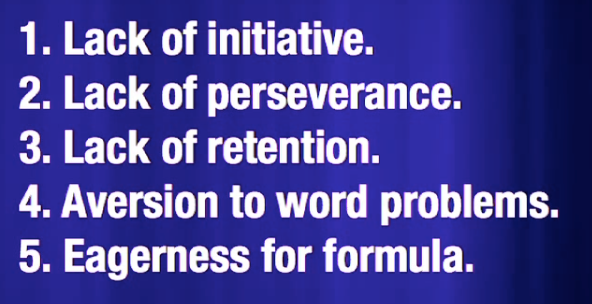 The three act science is based on the work of Dan Meyer see his TED Talk here who created three act maths in order to get students to think about and engage in maths - rather than simply follow sets of processes in order to get the 'right' answer. Any science teacher will recognise these as the same problems we face. Students wait for us to help them and give up if we don't, We think they've nailed it at the end of the lesson only to find that at the start of the next lesson they are mystified when you mention the concept again. If an exam question is worded slightly differently to the ones they have practiced they are completely flummoxed. They ask us to prepare them for exactly what will come up in the exam and blame us if it doesn't. This is a demonstration or video that is either counter intuitive or creates curiosity. The aim is to get the students engaged in deep thinking either in order to explain what they think will happen or why it happened. An example is this one. What order will the cartons fall over in? An effective way of assessing learning and ideas is to ask students to put their left right or both hands up to indicate their choice. So for example for the cartons above. If you think the last carton to fall over is the full one on your left, raise your left hand. If you think its the half full in the middle raise both hands. If its the empty one on your right raise your right hand. Now keep your hand/s up , go and find someone who disagrees with you and tell them why they are wrong. Another strategy to add thinking at this point is WMHI? This is simply asking the question What Might Happen If .... ? and get the students to continue - the boxes were lighter/heavier , sand was used instead of water .... then they can work it out or try it out. We can also take it a step further - So for the cartons if they all think the half full is the most stable - at what stage does reducing the amount of fluid from half full make it become less stable ie what is the point of maximum stability ? I am an instructional coach and am SO EXCITED for my science teachers to use 3 ACT Science tasks with their students. The video clips aren’t organized in an easily usable way, but I can do that for my teachers who are interested in using them. Thanks for creating and sharing! I can take the next steps for helping teachers get them ready to use.